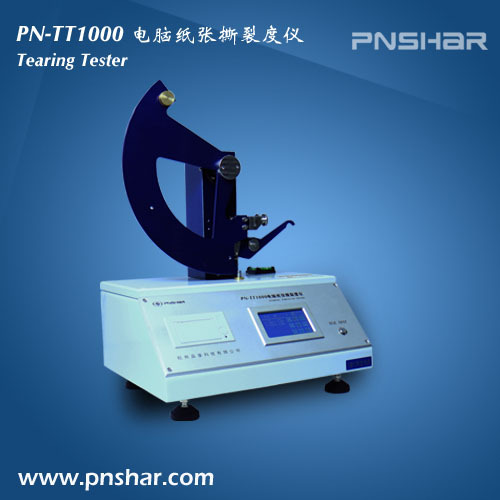 PN-TT1000 Tester is an electrical type instrument for paper tearing strength measurement. The tester is designed according to ISO 1974 (paper --tearing strength test method) and (GB455.1). It is a mechanotronics tester for all kinds of paper, as well as some low tearing strength of paperboard. This instrument does not apply to corrugated fibreboard,but it may be applied to the components of such boards. It is not suitable for determination the cross-direction tearing resistance of highly directional paper(or board). The instrument is designed according to ISO1974-1990 standard and GB/T455-2002 standard. It is an ideal tester for manufacturer of corrugated fiberboard and carton, scientific research and quality-control department. Press <Test> button, release pedulum automatically, eliminate human error. Touch-screen display and operating. Bilingual in English and Chinese interface. Bilingual operating interface in English and Chinese. Statistics: Average, Maximum, Minimum, standard deviation(SD),coefficient of variation(CV) and Tear Index. The upper edges of the clamping surfaces are in a horizontal line,lying at a distance:104mm±2mm. When the pendulum is in its initial position,ready for test, the clamps shall be separatd by a distance: (2.8±0.3)mm.